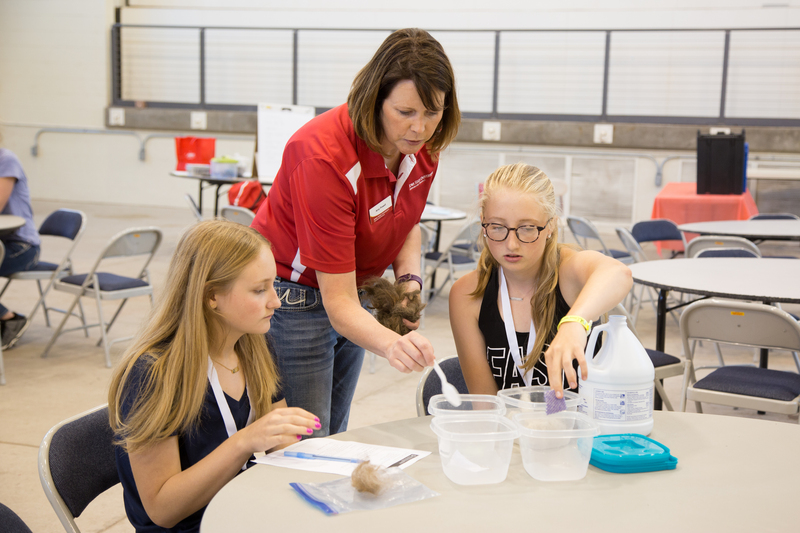 AMES, Iowa – Amy Powell started working to help 4-Hers throughout Iowa understand the basics of animal care when she came to Iowa State University in 2014. To find out how those youth acquire information about animal care Powell set up focus groups with extension professionals, volunteers and parents in five Iowa counties. She found that there were no guidelines in place for acquiring and disseminating information about animal care. “Out of the five programs only one person said they ever used an extension publication. Another source said they asked someone in the county how they raised their animals, which could create problems if they were doing something incorrectly,” Powell said. Powell, a 4-H animal science program specialist in Iowa State's animal science department, coordinates curriculum and activities for more than 16,000 youth enrolled in Iowa’s 4-H animal science projects, FFA and ag-focused classrooms. “There was a huge need to create accurate animal care information and have it online for easy access,” Powell said. To make animal care information available Powell decided to create an interactive video series called, Animal University. To help fund the project the Iowa Pork Producers Association gave $325,000 and the Iowa Beef Industry Council gave $100,000. Powell plans to produce modules that are both self-directed, but also can be used by leaders during 4-H meetings. She also hopes the programs can be used by teachers within a school program. “It’s set up on an interactive platform,” Powell said, “that gives students an incentive to get badges and other rewards. The interactive web-based curriculum also will help students understand the science behind animal care. She hopes students gain a better understanding about the reasons why animals need certain amounts of feed or why they behave in a certain way. Jodi Sterle, the Eldred and Donna Harman Professor for Excellence in Teaching and Learning in the Department of Animal Science, said the online curriculum will provide an updated method to communicate with 4-Hers about the care for their animals. Amy Powell, a 4-H animal science program specialist, leads youth in comparing natural fibers to synthetic fibers. Powell creates curriculum and activities to better understand the science of livestock production.